Brazil's impeachment crisis; Feds look into soccer sponsors; Trump, Clinton lead in New York ahead of primary; Verizon the favorite to acquire Yahoo; Beyonce teases mysterious Lemonade project. 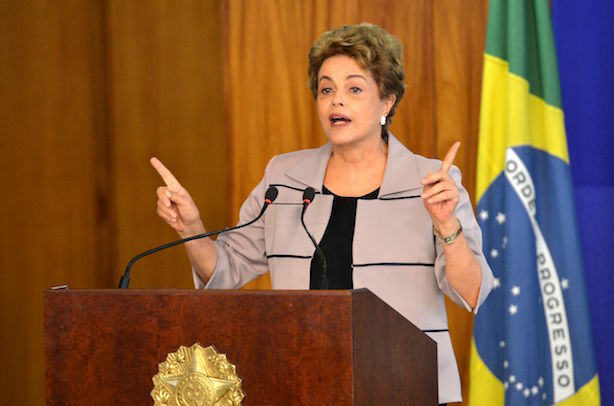 The lower house of Brazil’s legislature easily surpassed on Sunday night the two-thirds majority needed to impeach President Dilma Rousseff on charges of tampering with government accounts. The political crisis is one issue worrying sponsors of the Summer Olympic Games in Rio de Janeiro, along with environmental concerns and the Zika virus. The federal government’s investigation into international soccer corruption has expanded to look into the actions of several sponsors. Nearly a dozen international corporations are conducting internal probes, including Nike, DirecTV, Citibank, and J.P. Morgan, according to The Wall Street Journal. The Clinton and Trump campaigns have substantial leads in New York ahead of Tuesday’s primaries, though both candidates’ favorability ratings are suffering. Meanwhile, Bernie Sanders claimed record event turnout in Brooklyn on Sunday. The mobile’s carrier’s bid to buy Yahoo is looking more likely to come to fruition after several other potential suitors dropped out, including Time Inc. and Google parent Alphabet. Comcast, AT&T, and IAC/InterActiveCorp have also declined to make a bid, according to the WSJ scoop. But what is Lemonade? The singer has been teasing the debut of Lemonade on April 23, but fans aren’t sure whether the project will be an album, a film, or a combination of the two. Lemonade will debut on HBO on Saturday at 9 p.m.
Who’s offering tax day deals. Plusses and minuses of Trump’s Twitter strategy. California chain Sports Chalet posts on its website that it’s going out of business. Pepsi quarterly sales down 3%. Johnny Depp, Amber Heard issue sarcastic apology for Australian dog smuggling.